John Shipes began his formal martial arts training in 1978 under Master Roy Kurban in Arlington, Tx in Tae Kwon Do, and trained there for about 4 years. He moved to Palestine, Tx in 1981 when he first met Steve Warren, a student of Master Kise’s, and trained with him for about 3 months. He then joined the Cha Yon Ryu system of Master Kim Soo under instructor Ken Pickle, a more familiar Tae Kwon Do based system. This training continued for about a year when Sensei Shipes left Mr. Pickle’s school and returned to Sensei Warren’s school and has remained with Master Kise’s system ever since. 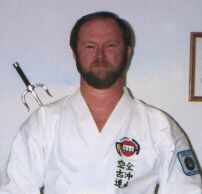 Sensei Shipes currently holds a Rokudan in Master Kise’s KenshinKan Karate-do, a Yondan in Tuitejitsu, a Yondan in Kobudo, and a Police Techniques Instructors certificate. Sensei Shipes was awarded his Shihan certificate by Master Kise in June of 1996. Sensei Shipes has also trained for many years under Sensei Richard Sapp, currently of Huntsville, Tx in karate-do and holds a fifth degree black belt under Sensei Sapp in American Shorin-kai karate and also holds a fourth degree black belt under Sensei Sapp in Shorin Kenpo-jitsu. Sensei Shipes also trained in Jun Fan Kung fu under Sifu Larry Hartsell via seminars and training camps. These camps consisted primarily of joint locking and grappling, trapping, Thai boxing, Kali, boxing, and Jun Fan techniques. Sensei trained for a short while in jujitsu and in Shotokan karate while living in Tucson. Sensei Shipes is active in the AOSKKF, as the Western US Director, and his training continues via summer camps with the GrandMaster, and visits with other instructors whenever possible. Sensei Shipes holds monthly weekend training sessions at his dojo in Athens, Texas to provide training opportunities to others in Kenshin Kan and other systems. Sensei Shipes currently resides in Athens, Texas where he is chief instructor at his dojo, Self Defense Concepts – Athens Karate School, where visitors are always welcome. He is also a knifemaker and a consultant to a mining company in Arizona.